Preparing to go on holiday can be a daunting task in and of itself, without taking into account something that many people overlook—how to properly notify customs while bringing in medicine from your home country. In a country as strict as Japan, you can never be too careful. Fortunately our friends at StudyTrip are here to help. There are two important documents involved in the process of bringing medicine to Japan. The first is “The Import Report," which—as the name implies—requires a detailed description and declaration of quantity of the medicine you would like to bring into the country. This does not only apply to prescription drugs, also includes cosmetics over a certain quantity, and over the counter medication you might get back home. Prescription medication also requires a copy of the prescription itself, complete with a doctor's signature. Once you have completed the import report and gathered the supporting documents, you have to send it by mail to the regional Bureau of Health and Welfare that corresponds to the airport you're arriving in (for example, Kanto if you're traveling to Narita). Once the document is verified and approvedif, you will receive the Medicine Import Certificate (薬監証明, yakkan shoumei) in English by e-mail or fax. You will need to print a copy of this certificate and hand it in to the customs official when you arrive at the airport. Getting the certificate can take as little as a week depending on where you are sending your documents from. The process is not difficult as long as you have taken the necessary steps to legally bring medication into Japan. 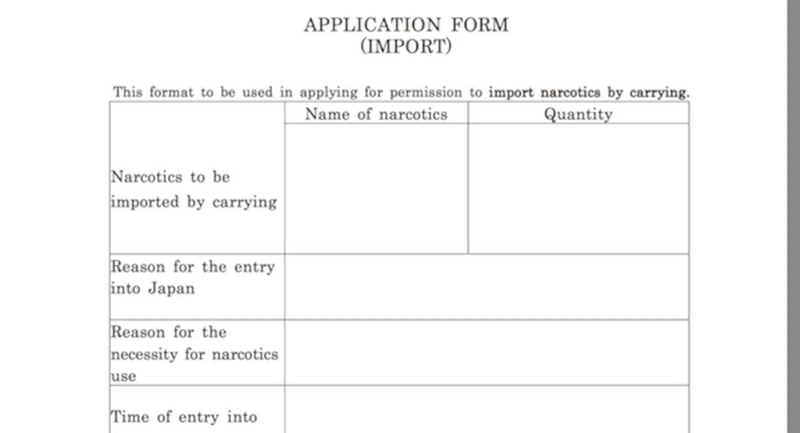 Be mindful that it is illegal to import prohibited or controlled narcotics and psychotropics, so if you're confused, contact the Pharmaceutical Inspector office nearest to your arrival airport or contact the Narcotics Control Department. Visit the Ministry of Health, Labour and Welfare or Japan Customs websites for further information. For those of you wondering what to do when you get sick in the land of the rising sun, it can be a bit more difficult than usual due to the language barrier and lack of familiarity with brands and products. If you want to be able to describe your symptoms to a pharmacist, here are some handy phrases to know. Keep in mind that these phrases aren't in their polite forms, for the sake of ease of communication (which can be especially difficult when you're under the weather). This is a fairly small list, but it should get you started. If you want to describe your symptoms to a greater degree, you can find a comprehensive list of different conditions here. Local drug stores like Matsumoto Kiyoshi can be found quite easily and offer lots of basic over the counter medication. If you find yourself needing to visit a doctor, clinic or hospital, the U.S. Embassy website contains useful information about where to find them, and whether or not you can expect any English-speaking ability. Recently the interesting phenomenon of "face mask fashion" has taken root. Although relatively unpopular outside of Asia, face masks in Japan can also be used as an accessory, not only as a means to avoid spreading. While convenience stores and supermarkets sport simple, single-color paper masks, it is not uncommon to find more fashion-forward face masks in other stores. For example the brand gonoturn, who have created the empowering (and somewhat baffling) "Cute is Justice!" concept. If you have prescription medication, be sure to follow the necessary step to bring them into the country safely and legally. As long as you act ahead of time, it's a fairly hassle-free experience. For those who get the occasional headache or runny nose, don't be afraid to visit a pharmacy or drugstore, since their large selection of medicine and knowledgeable pharmacists will likely have you covered. If you feel unwell and want to avoid spreading germs to others (and look kawaii in the process), be sure to sport a mask! We started as Go! Go! Nihon in 2009 and have been growing ever since. Originally having helped over 5000 long-term students travel to Japan, we realised that some people were still missing out and decided to start running study trips in 2012 combining short-term study and fun-filled activities.